Our goal is to provide complete, quality and affordable pet care for our clients. We stress client education and preventative medicine. Our practice deals with many types of animals but the majority of our patients are dogs and cats. 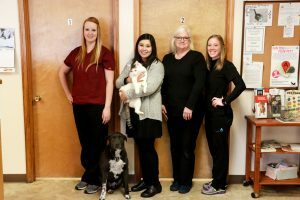 At Orofino Animal Clinic, we want to make sure your pet is happy and healthy. We offer a variety of general veterinary services for your pet that will put your mind at ease. Bringing your pet in for an annual exam ensures that your pet is in good health and if not, early detection will allow us to provide medical services to improve your pet’s health.